Marguerite L. Barrett, M.S., Lauren M. Wier, M.P.H., H. Joanna Jiang, Ph.D., and Claudia A. Steiner, M.D., M.P.H. Developing national benchmarks for hospital readmissions can help identify those patient populations with relatively high readmission rates for targeted improvement efforts. Furthermore, tracking changes in these benchmarks over time allows policymakers to monitor progress made toward reducing readmissions. This Healthcare Cost and Utilization Project (HCUP) Statistical Brief presents data on 30-day all-cause readmissions among patients aged 1 year and older by expected payer and patient age group. Trends in readmissions by payer are provided from 2009 through 2013. Changes in readmission rates from 2009 through 2013 and costs for index admissions (the initial inpatient stays) and readmissions for 2013 also are presented by payer and age group. The expected payer is determined by the index admission, although the expected payer of the readmission may be different. Figure 1 presents trends in 30-day all-cause readmission rate by expected payer from 2009 through 2013. For each expected payer, all patients aged 1 year and older are included in the readmission rate. Readmissions among all patients covered by Medicare declined from 18.1 per 100 admissions in 2011 to 17.3 per 100 in 2013, after being essentially unchanged from 2009 to 2011. In contrast, the readmission rate among patients who were covered by private insurance or Medicaid did not change appreciably from 2011 to 2013. Among uninsured individuals, both the number and rate of readmissions increased between 2009 and 2013 (10.6 percent increase in readmission count and 8.9 percent increase in readmission rate). The readmission rate among nonmaternal patients aged 1-20 years increased substantially between 2009 and 2013: 22 percent increase for uninsured patients, 15 percent increase for those with private insurance, and 8 percent increase for Medicaid patients. The average cost of a readmission was higher than the average cost of an index admission for all types of payers: 5 percent higher for patients covered by Medicare, 11 percent higher for uninsured patients, and about 30 percent higher for patients covered by Medicaid or private insurance. Note: The expected payer is determined by the index admission, not the readmission. Rates by expected payer include all patients aged 1 year and older. Figure 1. Rate of 30-day all-cause readmissions by expected payer, 2009-2013. 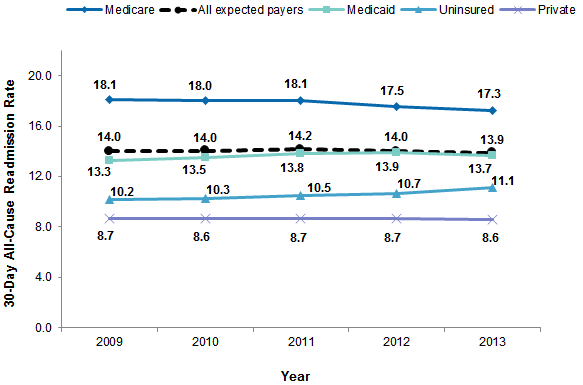 Figure 1 is a line graph that shows the 30-day all cause readmission rate for readmissions for all expected payers and separately for readmissions covered by Medicare, Medicaid, and private insurance and those that were uninsured for 2009 through 2013. The 30-day all-cause readmission rate for readmissions covered by all expected payers was 14.0 in 2009, 14.0 in 2010, 14.2 in 2011, 14.0 in 2012, and 13.9 in 2013. The 30-day all-cause readmission rate for readmissions covered by Medicare was 18.1 in 2009, 18.0 in 2010, 18.1 in 2011, 17.5 in 2012, and 17.3 in 2013. The 30-day all-cause readmission rate for readmissions covered by Medicaid was 13.3 in 2009, 13.5 in 2010, 13.8 in 2011, 13.9 in 2012, and 13.7 in 2013. The 30-day all-cause readmission rate for readmissions that were uninsured was 10.2 in 2009, 10.3 in 2010, 10.5 in 2011, 10.7 in 2012, and 11.1 in 2013. The 30-day all-cause readmission rate for readmissions covered by private insurance was 8.7 in 2009, 8.6 in 2010, 8.7 in 2011, 8.7 in 2012, and 8.6 in 2013. Readmissions among patients covered by Medicare declined from 2011 to 2013. The 30-day all-cause readmission rate among patients covered by Medicare declined from 18.1 per 100 admissions in 2011 to 17.3 per 100 admissions in 2013, after being essentially unchanged from 2009 to 2011. In contrast, the readmission rate among patients who were covered by private insurance or Medicaid did not change appreciably from 2011 to 2013. The overall rate of readmissions was highest for patients covered by Medicare. The 30-day all-cause readmission rate was consistently highest among patients covered by Medicare, followed by those covered by Medicaid, uninsured individuals, and those covered by private insurance. The 30-day all-cause readmission rate was more than twice as high among those covered by Medicare (17.3 percent in 2013) compared with those who had private insurance (8.6 percent in 2013). The overall readmission rate increased among those who were uninsured. From 2009 to 2013, the readmission rate for uninsured patients rose by 8.9 percent, from 10.2 to 11.1 per 100 admissions. The overall readmission rate for all expected payers combined did not change appreciably. From 2009 to 2013, the readmission rate for all payers combined stayed at about 14.0 per 100 admissions. Table 1 presents the readmission rate and the number of readmissions by expected payer and patient age group for 2009 and 2013. The percentage change in the readmission rate from 2009 to 2013 also is shown. a The expected payer is determined by the index admission, not the readmission. Information is not presented for three types of patients: (1) patients aged 0 years, (2) patients aged 1 year and above with other types of expected payer (e.g., local government programs, TRICARE, worker's compensation), and (3) patients aged 65 years and above for Medicaid, private, and uninsured. b Medicare patients under age 21 years are included in the Medicare total but are not reported separately because of the small number of cases. There is no maternal breakout for Medicare because of the small number of maternal stays in this group. Note: Percentage change was calculated from data that were not rounded. Both the number and rate of readmissions among patients aged 65 years and older covered by Medicare decreased from 2009 to 2013. From 2009 to 2013, there was a 6.1 percent decrease in the readmission rate among Medicare patients aged 65 years and older, from 17.3 to 16.2 per 100 index admissions. The number of readmissions for these patients decreased by 8.1 percent, from nearly 2 million to 1.8 million. Readmission rates decreased among maternal patients covered by Medicaid, those covered by private insurance, and those who were uninsured. Among maternal patients of any age, the readmission rate between 2009 and 2013 decreased by 15.3 percent for those covered by private insurance, by 9.3 percent for uninsured patients, and by 8.5 percent for those covered by Medicaid. The readmission rate among maternal patients was lower in 2013 for privately insured patients (3.0 per 100 index admissions) compared with those who were covered by Medicaid or who were uninsured (4.6 and 4.2 per 100 index admissions, respectively). Across all payer categories, the largest percentage decrease in the number of readmissions was among patients with private insurance. The number of readmissions decreased among all patients with insurance coverage. The rate of decrease was greatest for privately insured patients, 15.9 percent, compared with patients covered by Medicare (6.0 percent) or Medicaid (1.9 percent). The largest increase in the readmission rate between 2009 and 2013 was among nonmaternal patients aged 1-20 years who were covered by Medicaid or private insurance or were uninsured. The readmission rate increased between 2009 and 2013 for nonmaternal patients aged 1-20 years with Medicaid (8.1 percent) or private insurance (14.9 percent), or who were uninsured (22.0 percent). Among uninsured patients, both the total number and rate of readmissions increased substantially between 2009 and 2013. The readmission rate among patients who were uninsured increased by 8.9 percent, and the number of readmissions increased by 10.6 percent. The readmission rate for uninsured patients increased between 2009 and 2013 for nonmaternal patients aged 1-20 years (22.0 percent) and 21-44 years (13.9 percent), remained relatively stable for nonmaternal adults aged 45-64 years, and decreased for maternal patients (9.3 percent). Among patients covered by Medicaid, the total number and rate of readmissions remained relatively stable between 2009 and 2013. The readmission rate and the number of readmissions among patients covered by Medicaid remained relatively stable. The readmission rate for nonmaternal pediatric patients aged 1-20 years covered by Medicaid increased (8.1 percent), but there was a decrease in the number of readmissions (5.3 percent). Among maternal patients, there was a decrease in the rate of readmissions (8.5 percent) and number of readmissions (15.4 percent). Table 2 presents the average cost of index admissions, the average cost of readmissions, and the marginal and percentage increase in costs for readmissions, by expected payer and patient age group for 2013.
b Medicare patients under age 21 are included in the Medicare total but are not reported separately because of the small number of cases. There is no maternal breakout for Medicare because of the small number of maternal stays in this group. The average cost of a readmission was higher than the average cost of an index admission for each type of expected payer. In 2013, the average cost of a readmission was about $3,000 higher than the average cost of an index admission among patients covered by Medicaid or private insurance ($2,800 and $3,400, respectively). For uninsured patients, on average readmissions cost $1,000 more than index admissions. The marginal increase in the average cost of a readmission was lowest among patients covered by Medicare (readmissions were $700 more costly, on average, than the index admissions). The increase in the average cost of a readmission varied by age group and payer. Among nonmaternal patients aged 1-20 years, the average cost of a readmission was $4,300 (or 38.1 percent) higher than the average cost of an index admission for patients covered by Medicaid and $4,100 (or 38.7 percent) higher for those covered by private insurance. Among nonmaternal adults aged 21-44 years and 45-64 years, the increase in the average cost of a readmission over the average cost of an index admission was highest for those covered by private insurance ($2,100 and $1,600, respectively). In comparison, the marginal difference in the average cost of a readmission for those covered by Medicaid in these two age groups was negligible ($500 and -$100, respectively). Among maternal patients, the marginal increase in the average cost of a readmission was highest among those with private insurance ($2,200), followed by those who were uninsured ($1,900) or covered by Medicaid ($1,700). The estimates in this Statistical Brief are based upon data from the Healthcare Cost and Utilization Project (HCUP) 2013 Nationwide Readmissions Database (NRD) and the 2009-2012 State Inpatient Databases (SID). The SID were used to create readmissions analysis files consistent with the design of the 2013 NRD and weighted for national estimates. Patients younger than 1 year were excluded from the analysis because the patient linkage numbers for infants are available for less than half of the States. Infants account for about 12 percent of all admissions. Patients aged 1 year and above with an expected payer other than Medicare, Medicaid, private insurance, or uninsured and patients aged 65 years and above with an expected primary payer of Medicaid, private insurance, or uninsured also were excluded because of small sample size. Combined, these patients account for about 5 percent of all admissions. The methodology used in this Statistical Brief for counting index admissions and 30-day readmissions is consistent with the methods used for the all-payer 30-day readmission rate reported by Partnership for Patients.5 An index admission is defined as an inpatient stay discharged alive with a nonmissing length of stay (LOS). LOS is critical to determining the timing between inpatient stays. A patient is allowed to have multiple index admissions, regardless of the time elapsed between events. Consider a patient with four inpatient stays in 2013. If one stay starts on January 10, the next stay begins on January 20, the third stay begins on January 27th, and the fourth starts on March 30th, all four are counted as index admissions. Index admission counts presented in this Statistical Brief include inpatient stays that qualify as an index admission from January through December 2013 (12 months). An index admission also can be a readmission. A readmission is an inpatient stay that begins within 30 days of the discharge date of an index admission and can be to the same or a different hospital. The readmission can be for any cause and may or may not be related to the care received at the index admission. No more than one readmission is counted within the 30-day period. In the case of index admissions for which there was more than one readmission in the 30-day period, the data presented in this Statistical Brief reflect the characteristics and costs of the first readmission. Because the NRD and SID are calendar-year files, readmissions are identified using index admissions discharged in January through November 2013. This allows an equal opportunity to find a readmission within 30 days. In this Statistical Brief, the readmission counts are 12-month counts calculated by multiplying the readmission rate by the 12-month index admission counts. Table 3 demonstrates how index admissions and readmissions are identified for a patient with five inpatient stays in a year. Counted as an index admission? Counted as a 30-day all-cause readmission? January 27 Yes Yes, counted as readmission to stay on January 20. Not counted as readmission to stay on January 10 because only 1 readmission is counted per index. If a patient was transferred to a different hospital on the same day or was transferred within the same hospital, the two events were considered a continuation of care and the second stay was not counted as a readmission. In contrast to an index admission, a readmission may result in discharge alive or dead and does not require the LOS to be nonmissing. The readmission rate is the percentage of index admissions that are readmitted within 30 days. The denominator is the number of index admissions discharged in January through November 2013. The numerator is the number of index admissions in the denominator that had a readmission for any cause within 30 days. Table 3 demonstrates that the readmission rate is 50 percent (2 readmissions / 4 index events) for a patient seen in the hospital five times in the year. The NRD is based on data from community hospitals, which are defined as short-term, non-Federal, general, and other hospitals, excluding hospital units of other institutions (e.g., prisons). The NRD includes obstetrics and gynecology, otolaryngology, orthopedic, cancer, pediatric, public, and academic medical hospitals. Excluded are long-term care facilities such as rehabilitation, long-term acute care, psychiatric, and alcoholism and chemical dependency hospitals. However, if a patient received long-term care, rehabilitation, or treatment for psychiatric or chemical dependency conditions in a community hospital, the discharge record for that stay is included in the NRD. This analysis used SID limited to data from community hospitals, which are defined as short-term, non-Federal, general, and other hospitals, excluding hospital units of other institutions (e.g., prisons). Community hospitals include obstetrics and gynecology, otolaryngology, orthopedic, cancer, pediatric, public, and academic medical hospitals. Excluded for this analysis are long-term care facilities such as rehabilitation, psychiatric, and alcoholism and chemical dependency hospitals. However, if a patient received long-term care, rehabilitation, or treatment for psychiatric or chemical dependency conditions in a community hospital, the discharge record for that stay was included in the analysis. The unit of analysis is the individual patient identified by the synthetic patient-level identifier. A patient will have multiple records in the NRD or SID if he or she has multiple hospital admissions in the year. Total hospital charges were converted to costs using HCUP Cost-to-Charge Ratios based on hospital accounting reports from the Centers for Medicare & Medicaid Services (CMS).6 Costs reflect the actual expenses incurred in the production of hospital services, such as wages, supplies, and utility costs; charges represent the amount a hospital billed for the case. For each hospital, a hospital-wide cost-to-charge ratio is used. Hospital charges reflect the amount the hospital billed for the entire hospital stay and do not include professional (physician) fees. For the purposes of this Statistical Brief, costs are reported to the nearest hundred. Other: includes Worker's Compensation, TRICARE/CHAMPUS, CHAMPVA, Title V, and other government programs. Hospital stays billed to the State Children's Health Insurance Program (SCHIP) may be classified as Medicaid, Private Insurance, or Other, depending on the structure of the State program. Because most State data do not identify patients in SCHIP specifically, it is not possible to present this information separately. If the primary or secondary expected payer indicates Medicare, then the payer category is assigned to Medicare. This categorization includes patients who are dually eligible for Medicare and Medicaid under Medicare. If not Medicare and the primary or secondary expected payer indicates Medicaid, then the payer category is Medicaid. If not Medicare or Medicaid and the primary or secondary expected payer indicates private insurance, then the payer category is private. If not Medicare, Medicaid, or private and the primary expected payer indicates self-pay or no charge, then the payer category is uninsured. Stays for other types of payers are not reported in this Statistical Brief because this is a small group of mixed payers such as State and local programs. Categorization of the readmission counts and costs by expected payer was based on the index stay. The concordance between the expected payer coded at the index stay and the expected payer coded at readmission varies by payer: 98 percent for Medicare, 95 percent for Medicaid, 93 percent for private, and 80 percent for uninsured (percentages based on the 2013 NRD). The HCUP NRD is a calendar-year, discharge-level database constructed from the HCUP SID with verified patient linkage numbers that can be used to track a person across hospitals within a State. The 2013 NRD is available for purchase through the HCUP Central Distributor. The NRD is designed to support various types of analyses of national readmission rates. The database includes discharges for patients with and without repeat hospital visits in a year and those who have died in the hospital. Repeat stays may or may not be related. The criteria to determine the relationship between hospital admissions are left to the analyst using the NRD. The NRD was constructed as a sample of convenience consisting of 100 percent of the eligible discharges. Discharge weights for national estimates are developed using the target universe of community hospitals (excluding rehabilitation and long-term acute care hospitals) in the United States. Over time, the sampling frame for the NRD will change; thus, the number of States contributing to the NRD will vary from year to year. The NRD is intended for national estimates only; no regional, State-, or hospital-specific estimates can be produced. The HCUP SID are hospital inpatient databases from data organizations participating in HCUP. The SID contain the universe of the inpatient discharge abstracts in the participating HCUP States, translated into a uniform format to facilitate multistate comparisons and analyses. Together, the SID encompass more than 95 percent of all U.S. community hospital discharges. The SID can be used to investigate questions unique to one State, to compare data from two or more States, to conduct market-area variation analyses, and to identify State-specific trends in inpatient care utilization, access, charges, and outcomes. Barrett ML (M.L. Barrett, Inc.), Wier LM (Truven Health Analytics), Jiang HJ (AHRQ), Steiner CA (AHRQ). All-Cause Readmissions by Payer and Age, 2009-2013. HCUP Statistical Brief #199. December 2015. Agency for Healthcare Research and Quality, Rockville, MD. http://www.hcup-us.ahrq.gov/reports/statbriefs/sb199-Readmissions-Payer-Age.pdf. The authors would like to acknowledge the contributions of Minya Sheng of Truven Health Analytics. 1 U.S. Department of Health and Human Services, National Quality Strategy. 2013 Annual Progress Report to Congress: National Strategy for Quality Improvement in Health Care. July 2013, Updated July 2014. http://www.ahrq.gov/workingforquality/reports/annual-reports/nqs2013annlrpt.htm#tab1. Accessed November 13, 2015. 2 Agency for Healthcare Research and Quality. Re-Engineered Discharge (RED) Toolkit. June 2015. Rockville, MD: Agency for Healthcare Research and Quality. http://www.ahrq.gov/professionals/systems/hospital/red/toolkit/index.html. Accessed November 13, 2015. 3 Coleman EA, Parry C, Chalmers S, Min SJ. The care transitions intervention: results of a randomized controlled trial. Arch Intern Med. 2006;166(17):1822-8. 4 Agency for Healthcare Research and Quality. Hospital Guide to Reducing Medicaid Readmissions. August 2014. Rockville, MD: Agency for Healthcare Research and Quality. http://www.ahrq.gov/professionals/systems/hospital/medicaidreadmitguide/index.html. Accessed November 13, 2015. 5 U.S. Department of Health and Human Services, National Quality Strategy. 2013 Annual Progress Report to Congress: National Strategy for Quality Improvement in Health Care. July 2013, Updated July 2014. http://www.ahrq.gov/workingforquality/reports/annual-reports/nqs2013annlrpt.htm#tab1. Accessed November 13, 2015. 6 Agency for Healthcare Research and Quality. HCUP Cost-to-Charge Ratio (CCR) Files. Healthcare Cost and Utilization Project (HCUP). 2001-2012. Rockville, MD: Agency for Healthcare Research and Quality. Updated December 2014. http://www.hcup-us.ahrq.gov/db/state/costtocharge.jsp. Accessed January 7, 2015. 7 The 2013 NRD available for purchase through the HCUP Central Distributor includes the data element for the primary expected payer but not the data element for secondary expected payer. Internet Citation: Statistical Brief #199. Healthcare Cost and Utilization Project (HCUP). December 2015. Agency for Healthcare Research and Quality, Rockville, MD. www.hcup-us.ahrq.gov/reports/statbriefs/sb199-Readmissions-Payer-Age.jsp.